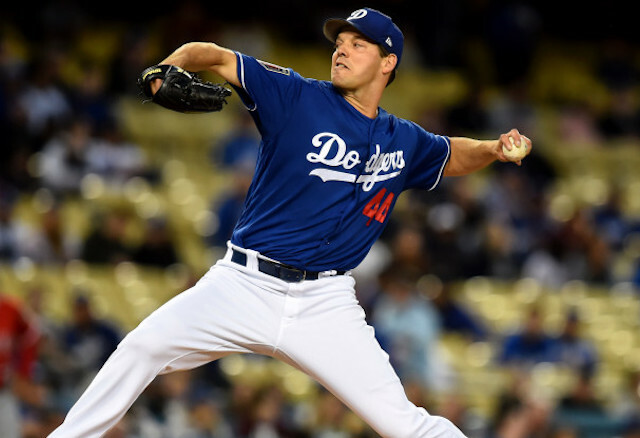 Los Angeles Dodgers left-hander Rich Hill made his final tuneup start before the regular season on Monday against the Los Angeles Angels of Anaheim in the second of the three-game Freeway Series. He logged five innings during the contest, yielding eight hits and four runs (three earned) while recording four strikeouts. For Hill, it was his second consecutive loss, but there were many positives to takeaway. The Angels, for example, scored all four of their runs in the third inning. With the exception of that frame, Hill posted four goose eggs on the scoreboard. And despite falling behind in some counts, it was also Hill’s fourth consecutive start without issuing a walk. He finished his spring campaign with 13 total strikeouts and no free passes across 12.1 innings. “I felt better as the game went on, the ball definitely came out of my hand the way I wanted it to,” Hill explained. “Falling behind early on in counts is obviously something I don’t want to do, but the command got better as the game went on. Hill also emphasized how important it was for him to accumulate a spring-high five innings during his start against the Angels. “Yeah, I think that’s one of the main objectives of Spring Training,” he said. “Get your work in, I hate to use that term, ‘Get your work in,’ because you’re out there competing and you’re trying to, obviously, come out of it on the other end with a win. But removing yourself from the results and focusing in on pitch process was something that was good to have. Though his 2018 Spring Training statistics may not indicate success, the 38-year-old believes he’s in a better position to start the season when compared to last year. Dodgers manager Dave Roberts echoed similar sentiments, and believes Hill far outperformed his overall numbers in Spring Training. Hill experimented with a split-finger grip on some of his pitches this spring, and revealed he will strategically utilize it during the regular season. Hill will next take the mound on Sunday, April 1, in the finale of the opening four-game series with the San Francisco Giants at Dodger Stadium.